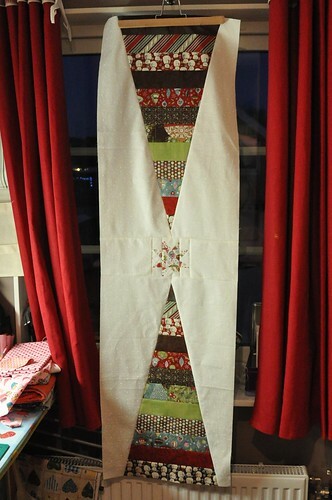 Over a year ago I saw a video tutorial on Youtube on how to make a Christmas tree table runner from a Jelly roll. It was super easy and I really wanted to have it done before Christmas this year. I bought Fruitcake by Basic Grey for Moda and it's perfect for this. I used part of the jelly roll block to make curtains for the lunch nook and I had well intended plans to make a runner before the holidays. Then Sofia got chicken pox and suddenly it was Christmas and no point any more. But when my free Saturday rolled around on Jan 1st I decided to start it and that way I might have the runner done by next Christmas. I basted it last night and started quilting it on my machine, but since I used green thread on the top and white on the back it looked really bad on the backside. 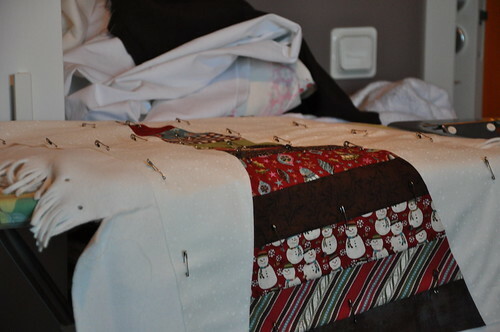 So I've almost decided to pick out the quilting I've done and hand quilt it instead .. after all. I have almost 12 months to get it done.